Due to the weather the track opening will not be happening on April 26th. We will keep you posted for the start on the following week May 3rd.. Of course weather permitting! This decision will be made on a weekly bases. Please stay in touch for further updates here on our website or on Facebook. enjoy a night under the stars and racing. Cans and plastic bottles only! ANYONE ENTERING THE PITS MUST HAVE PHOTO ID. Any "Park & View" spots that are not sold by 6pm can be used for free. All Drivers or Owners Must Fill out a Payout Form at the Track before they can receive any Purse Money. A photo copy of Drivers' lic. and Social Security card is required!! (Monroeton, PA) Perhaps the biggest win of all fell squarely on track management at The Hill Speedway with their bold move to go forward with the Jerry Johnson and Sons Stone Quarries season finale. Rain fell at 4 PM forcing late track prep, but the surface was race-ready just after 7 PM on a night of 30-lap features and championship declarations. Feature winners were Keith Jack Lamphere (IMCA Type Modifieds), Rich Powell (Crate Sportsmen), Bobby Benjamin (Street Stocks), Adam DelGrosso (FWD) and Mike Koser (RWD). Track champions, in that order, are Gary Lamphere, Ray Smith, Kevin Garland, Adam DelGrosso and Mike Koser. The 30-lap IMCA Type Modified feature was caution-filled, but those interruptions were of no consequence to race winner Keith Jack Lamphere. The race was sloppy from the get-go, as six cars came together in the first turn after taking the green. Keith Jack and point leader Gary Lamphere were among the group but both continued. Keith Jack led from lap four on and his mastery of the high groove is a work of art. He got his fourth win of the year, this time over G. Lamphere, Bobby Maynard, Al Silvernail and Harry Ely. Gary Lamphere, who won his heat, also won the 2018 track championship. Brad Sites won the other heat race. In the Crate Sportsman division, title contenders Ajay Potrzebowski and Ray Smith arrived separated by one point and facing a 30-lap, double points-paying feature. Dalton Maynard and Potrzebowski won the two heats and the stage was set. When Rich Powell unloaded his 333, he was ready for action. He led from lap five on, and the championship chasers were among the top five. Smith turned it on and had third at lap 17, then he passed Maynard for second. From his fourth-place position Potrzebowski could only watch his title hopes fade. Powell got the race win over Smith, Maynard, Potrzebowski and Mike Collins. Smith hauled back to Hornell, NY as the 2018 track champion. Kevin Garland probably stressed all week knowing he was going into the final Street Stock feature with a slim eight-point advantage over Tom Savercool. When he didn’t show, Garland just needed a decent finish. When Bobby Benjamin unloaded his car for the second time this year, his last memory was of parking in victory lane. He did it again, despite seven cautions that led to single-file restarts. Garland’s night ended early, but heat winner Benjamin proved he was the man to beat. Cody Kershner had another solid run that earned him a second-place finish to Benjamin. Heat winner Bobby Hall, Abe Romanik and Jesse Snell rounded out the top five. Kevin Garland is the track’s 2018 Street Stock champion. Adam DelGrosso only needed a decent finish to clinch the 2018 title in the 4 Cylinder FWD division. Trevor Williams and Matt McKernan led the lion’s share of the 30-lap race until the lion himself roared into the top spot and stayed there. DelGrosso took the lead from McKernan on lap 17, he pulled away, and he made his eighth win look easy. The 2018 champion defeated McKernan, Williams, Matt Browning and heat winner Bob Schultz in the last race of the year. In 4 Cylinder RWD action Mike Koser arrived with a 114-point advantage and left the champion after sweeping his heat and the 30-lap feature. Koser, running second to heat winner Larry Colton, took advantage of an opportunity when Colton got loose in turn four and he passed him for the lead on lap 12. From then on, he checked out and got the win over Alan Blackwell, Tim Bush, Colton and Anton Smith. That wraps up the 2018 season at The Hill Speedway. Watch for updates over the winter on the track’s website www.thehillspeedway.com or ‘like’ them on Facebook. Track management thanks all of the race teams, sponsors and spectators for their support. 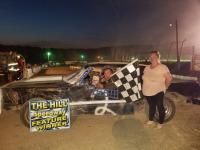 · In post-race drawings, Crate Sportsman driver, Mike Collins won nerf bars from Snell Metalfab, Collins and Rich Powell won front bumpers from Kevin “Cupcake” Curry, and Potrzebowski won $25 cash from Schmeckenbecker Hair Salon. · Several lucky boys and girls left with new bicycles from special giveaways.